I’d only become aware of Bisphenol A (BPA) and its hazards relatively recently. Before this, all I knew was that disposable plastic boxes and drinking water bottles should not be reused too often but I did not know why. The reason is Bisphenol A which is a compound used primarily in the making of polycarbonate plastics. Polycarbonate plastic is the hard clear plastic usually used in the making of drinking bottles, baby bottles, food containers – the main areas which pose a risk of this chemical leeching into our food and drink and potentially causing toxic reactions including cancer. According to research, putting hot liquids in plastic containers containing Bisphenol A or allowing liquids to heat up in such containers may cause the plastic to break down and the Bisphenol A to leech into your food and drink. This is the reason why you are not advised to keep your plastic water bottle in your hot car or to use certain plastics in the microwave or to store hot food. Since I was aware of Bisphenol A and its possible side effects I’ve decided to play it safe and avoid using plastic products which may contain Bisphenol A as far as possible. I use the international Resin Identification Code as a rough guide. If you look at your newer plastic items, you will notice somewhere on it a triangle and a number in it. This is the code which tells you what sort of plastic this product is made of and how it may be recycled as not all plastics are recycled the same way. I stick to plastics that show Nos. 1, 2, 4, 5 and 6 as apparently no Bisphenol A is used in the polymerization process of these plastics. You might notice that hard plastic bottles are very commonly found in the household department these days ever since people stopped reusing their mineral water bottles over and over. However, not all plastics are BPA free and I tend to steer clear of plastics that do not show a Resin Identification Code just to be on the safe side. For bringing food to work, I use Lock n Lock boxes. Mine are all labeled 5 (Polypropylene). For drinking water, I use Bros bottles (No. 5). For food storage, I use Rubbermaid (the Bisphenol A free ones). I could not find any information on the plastics used in Tupperware but this link tells us that only a handful of Tupperware lines contain Bisphenol A. Still I play it safe and only use it to store dry goods like biscuits, sugar etc. Whilst Bisphenol A leeches out most if the container is heated or if heated items are placed in it, I’m not taking chances. After all, I do not know just how hot “heated” means and neither do I know if it’ll leech out anyway. 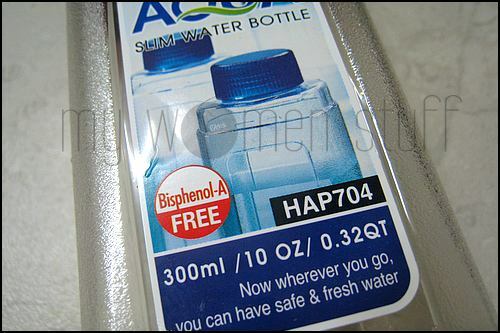 I do not have kids so I cannot vouch for feeding bottles or children friendly plastics that are Bisphenol A free. If you are a mother and do know, please feel free to help out in the comments below. The best option for food and drink of course is glass. It can last you nearly forever, has no chemicals, will not stain and is odour-less. It is however, fragile and heavy. I do try to use glass containers for keeping food at home where possible but it also takes up too much space in the freezer 😛 Another option is stainless steel but I’m a little bit wary about that too as quality of stainless steel differs and I’ve seen some kinds of stainless steel discolour upon contact with heat too. Have you thought about this subject? Do you take note of your plastics for food and drink? What products do you know of that are Bisphenol-A free or that you would recommend for keeping food and drink? NEXT POST: Swank it up with Lux and Priyanka Chopra : Win A LE Lux Beauty Pack! *sigh* I made the switch from carrying around a plastic bottle to glass a while back. It’s so hard to avoid plastic though! I will try to buy from more well-known brands. Like Nalgene for water bottles. As for the plastic in my home, hmmm, I seldom use plastic. Normally, my mother stores food in stainless steel bowls or ceramics. I have a littl bit of concern over stainless steel too – not all stainless steel is made equally. But I do agree – the more well known brands of plastic goods for food storage tend to be labelled quite clearly. I freaked out when I read about it in baby bottles and replaced Little Monkey’s bottles right away with BPA-free stuff. Should be more concerned about my own stuff too actually. Yup yup! BPA free your home! Esp with little Monkey growing up. Good topic PB–I only really started paying more attention to BPA when I was out buying baby bottles for Grace. Since it’s something that is constantly frozen, heated up and sterilized, I had to hunt down BPA free bottles. For baby bottles I can vouch for the brand called Medela. Even then, I was told by the salesperson that since it is something that is heated up on a daily basis, I will need to replace the bottles every 6 months due to the wear and tear! But I reckon for regular food containers that you don’t sterilize daily, it’s ok to keep them much much longer. It’s probably only an issue if you use a dishwasher with hot water. Glad you paid attention BEFORE you went shopping for Grace! 🙂 Thankfully I don’t believe in dishwashers – and yes if plastic is constantly heated up over and over it might be best to replace them often. Thanks for the reminder. I have started using Bros Stainless Steel bottle recently, after reading emails on BPA. SIGG, producer of aluminium water bottles were recently in the spotlight after consumer found out that their aluminium water bottle internal were layered with materials similar to BPA. In some countries, they are doing replacement for the water bottle, I am not sure if they will do the same here. Sigg were quite pricy as I recall. Stainless steel bottle is more affordable, IMHO. I didn’t know about stainless steel bottles by Bros! I don’t use SIGG as I don’t believe in aluminium and neither do I believe in paying that much for a water bottle that can hold so little. The thin plastic bags used outside aren’t BPA safe as I recall so yeah, I do cringe too when I see hot soup going into the bags. Glad you’re bringing your own cases for “ta pau” – its saving the environment too! important issue… It is a bit of extra thought to see what goes into our products. I love glass, but would never carry water around with me if I had to use a glass bottle, so i use my trusty liquitainer. Yeah about Sigg…. had an article about that sitting in my wordpress for MONTHS, but haven’t published it yet. The fact is, aluminium is not a good material for water bottles. It’s lightweight, yes, but so easy to dent, plus it’s not safe to drink from, so they always line it with an epoxy liner which is… plastic! No different from using a plastic bottle and actually inferior to using plastic bottles that are BPA free. Thanks for the clarification Tiny Tapir. i have changed my bb feeding bottles to bpa free bottles and use glass container to store drinking water. i also bot glass feeding bottles but they are too heavy n fragile n i set them aside. i also noticed that famous plastic container like lock n lock do have Bpa free range. Yes I’d read about some mums using glass feeding bottles but I think that would be a bit too inconvenient and heavy as you say. Glad you’re staying BPA free for baby! Hello, I came to this article from another article about what is causing women to have such larger breasts and one of the possible reasonings is that BPA is a xenoestrogen. I was so freaked out that it is a horomone, I threw out every dish or eating utensil in my home that was plastic and ordered glass baby bottles for Gabby my 5 month old preemie. I am so happy to have found this. Does anyone know if the Poland Spring water cooler bottles are BPA-free? I’m interested in the Bros bottles that you are using, I am wondering if it can withstand warm/hot water?? i try to use glass and stainless steel as much as possible when cooking and storing. i did not think about ss being of different qualities, but i can see how that could be so. come to think of it i believe i have heard that glass can contain things other than sand, i thought it was to make other colors in the glass. interesting discussion. thanks. i have found with less sturdy glass botles you can place them in a sock. it not only helps to insulate the ottle thermally but from shock and potential breakage. and if it does break, the broken glass collects in the sock. I am 1-day old in this blog and came across this topic re BPA. I came to know about it almost 2 years ago and spent a lot of times checking the related websites. I have no children but since then, I’ve replaced all my nephews and nieces’ water bottles to Nalgene BPA-free bottles * which I managed to find in KLCC (a shop called Tearproof). They are not cheap but worth buying (RM46++ I think after discount). I’ve got 2 for myself and had been enjoyed using them. I like the small mouthpiece type. The only disadvantage is that it leaks if not capped properly or when it is not positioned upright in the bag. Nevertheless, I still wouldn’t trade it with any other bottles. Also, I have replaced my younger nephew and niece’s milk bottles to an European brand called MAM which is BPA-free and so far no complain from their mums. Not cheap too but quality is better. I managed to order from a distributor in Msia directly as I couldn’t find it off the shelf. Somehow I felt much more relief after replacing the bottles to Nalgene and MAM, and I was glad I learned something out of the whole search. The only thing I have not changed is my food tupperware and I won’t mind some recommendations. Interesting post. I’m just researching as part of my war on plastics in the home but I think there’s more to avoid than BPA. I would avoid polystyrene completely because it puts styrene in your food which is linked to cancer. I really appreciate some of your links too, you’ve gone to a lot of work and it’ll save me some research. Thanks for your post.